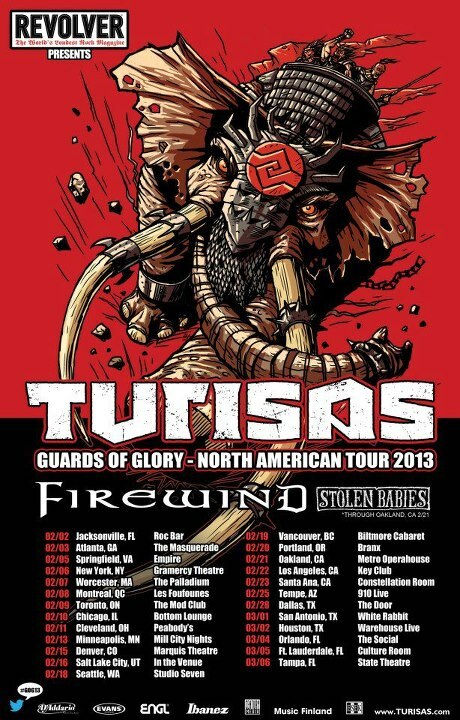 TURISAS announces North American headlining tour with FIREWIND, STOLEN BABIES After headlining the North American “PaganFest” tour this past Spring, Finnish metallers TURISAS will once again return to the States in February/March 2013 for a headlining tour featuring FIREWIND and STOLEN BABIES. “Back to America straight out of the studio! We’ve spent the last six months off the road writing some new killer tunes and are just about to start recording them as we speak. TURISAS is currently finishing work on their latest studio album, which they are looking to release in summer 2013 and more tour dates will be added.